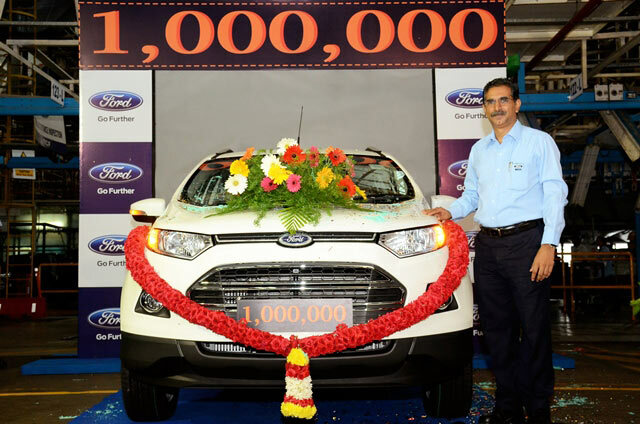 Ford India’s Chennai plant produced one millionth vehicle and engine at its Chennai Vehicle Assembly and Engine Plant (CVAEP), a milestone for the facility that kick-started the company’s growth journey in the dynamic Indian market in 1999. India’s most awarded vehicle ever, the Ford EcoSport was the millionth vehicle to roll off the Chennai assembly line on Wednesday. Balasundaram Radhakrishnan, executive director – manufacturing at Ford Chennai Vehicle Assembly & Engine Plant, said. Apart from being a global manufacturing hub for Ford, the facility has set new benchmarks in adopting processes that not only ensure global quality but significantly reduce our carbon footprint. Ford India’s US$ 1 billion manufacturing facility at Chennai started commercial production 16-years ago in 1999 and today makes the company’s globally-renowned nameplates Ford EcoSport, Ford Fiesta and Ford Endeavour. Spread over 350 acres, the integrated Chennai complex also houses an engine assembly plant that started commercial operations in 2008. The engine plant features Ford’s single-flexible production line, configured to build both petrol and diesel engines simultaneously. The integrated Chennai facility has an installed capacity to assemble up to 200,000 vehicles and 340,000 engines a year. Ford has implemented several environment-friendly practices at Chennai plant and is one of Ford’s five zero-landfill facilities in the Asia Pacific region. This ensures that the entire hazardous waste generated at the plant is either recycled or co-processed into allied cement industries. The company has reduced its energy consumption at Chennai by 16% while water consumption by 30% in producing each car since 2009 through various process improvements. The plant also treats and reuses 100% of its water within the facility, making this a zero liquid discharge factory. The Chennai facility has been key part to Ford’s ‘Make in India’ vision establishing India as a global manufacturing hub for small cars and low-displacement engines. Apart from meeting local demand, the quality vehicles and engines made at Ford’s Chennai facility are exported to more than 40 markets across the globe, including parts of ASEAN, Europe, Middle-East and Africa. The millionth vehicle and engine production milestone stands as a testament to the passion and dedication of more than 6,000 hardworking men and women at Chennai.